General Characteristics: Medium in height, well spreading, maturing within 8 to 12 months, producing from 5 to 10 oha; identified by pale green petioles with broad, purplish-black edges. Petiole: 70 to 90 cm. long, pale green often tinged with reddish-brown at apex, pinkish at base with a reddish-purple ring, the edge conspicuous, broad, purplish-black with adjacent dark green blotches. Leaf blade: 40 to 55 cm. long, 35 to 45 cm. wide, 35 to 45 cm. from tip to base of sinus, broadly sagittate, drooping, medium green with pinkish cast when young; margins slightly undulate; piko pinkish; veins reddish on lower surface; lobes acute with medium-cut sinus. Corm: Flesh pale pinkish with purplish fibers; skin dark pinkish. 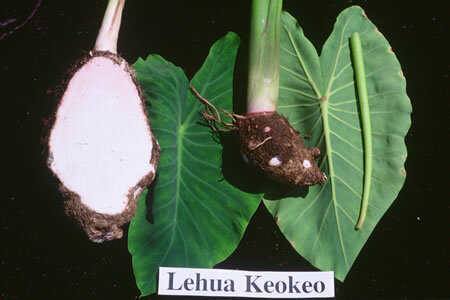 Origin, and derivation of name: An old native variety; the descriptive name Keokeo is derived from the pale coloring of the petiole. Distribution: Grown in a few scattered localities, primarily under upland culture. Use: Makes red poi of good quality. Remarks: This variety is reputed to make very luxuriant growth in certain sections, rivaling the Lauloa group.